This is actually the third version of my map. And it won't be the last one. Wunderfoll! Das sieht wirklich toll aus! 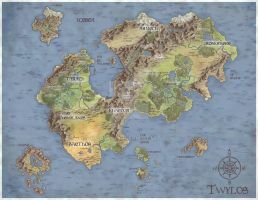 Of your Caeruin Maps I like this one the best! I was wondering, have you ever thought of doing a tutorial? I would love to see the layers & your process for something like this. The thing is, when a map is finished, I often don't know what I've exactly done. I play around with so much filters, brushes, adjustment layers and blendmodi and that often over many months / years, that the style is normally not reproducable the same way. Wow, you´re a great Worldmap Designer! Thanks a lot! I'm glad you like what I'm doing. I draw my own fantasy kingdom maps. What about Duaria and Silvetops? Nope, these are not my favs. Nevertheless, interesting maps. Reminds me of early graphic adventures. Wow. I love the hand-drawn feel of this one. And it's really professional-looking. I'm sad I can't read German though With a map this detailed I really want to know more about your world. Well, the boxes are telling the story of the first settlements from an ancient culture, fleeing from Maurarchor, a continent in the east that fell into darkness (because of failed magic, a war of the gods and some stuff like that). The poem at the edge tells something more about that. Ah, that sounds very cool! I'm speachless. Please...do me the pleasure of telling me what program you've used for this. I've been trying to make a world map of my own, and the best examples on DA--of which I'd place this in the category of--all use this style of map! I'd use photoshop cs2 for this map. Started with a simply conture of the landscape, put a pattern (or better, in this case, tons of patterns) on it and added some mountains / trees with a selfmade brush. At least followed the names of the lands and citys, some decoration elements and it was finished. As I started mapmaking with photoshop (it was around 2004), I created the file, I'm still working on today. So it is impossible to tell, how long this map took me to create. Too long, I expect.